Big asteroid will hit Eart in 2880 ... or will it? Big asteroid will hit Eart in 2880 … or will it? You’re likely to read this news on other media as “Huge asteroid will hit the Earth in 2880” – that’s bull, and I’ll explain why. A Hollywoodian artistic representation of an asteroid hitting the Earth. Image credits: Alamy. The kilometre-wide asteroid 1950 DA has a one-in-300 chance on 16 March, 2880. 1 in 300 chance is indeed a bit unnerving, but let’s put things into perspective here – the odds are the same as you guessing the next number in the roulette 2 times in a row. It’s not happening, almost certainly. Also, this is the most likely asteroid to hit our planet in the foreseeable future. It’s admirable that researchers are studying its trajectory and “travel habits” even now, almost a millennium before its projected potential impact, and that’s why we have a pretty good safety net when it comes to asteroids: we’ll see it coming. According to their research, published in the science journal Nature, the asteroid has a diameter of one kilometre and is travelling at nine miles a second relative to the Earth. It’s also rotating incredibly fast – so fast that it’s a wonder it’s not breaking apart. 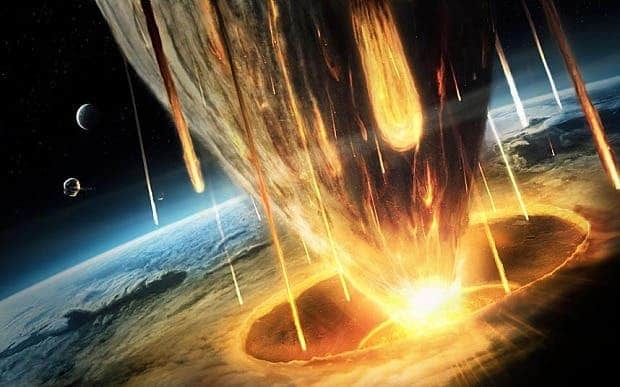 Should it indeed hit Earth, it would devastate life as we know, creating a similar impact to the one which likely wiped off the dinosaurs at the end of the Mesozoic. Meanwhile, we have much more serious problems to deal with – for example the mass extinction we’re causing at the moment, or the rising temperatures which again we are to blame for, or the ocean acidification. Just sayin’.